Our key aim is that tradition and technology work in unison and that our vines be truly cosseted. We therefore work in tune with the environment, using the many natural resources available, and exercise ‘healthcare’ on the basis of proven, age old practical cultural conditions. At Menade, therefore, we use no chemical treatments opting instead for a natural approach consisting for example of plant-based infusions (nettles, cinnamon…) or whey, which are kinder on the soil, plants and naturally occurring yeasts. In a similar way, the insect population that teams in our soils far from being our enemies are trusted allies that help us ward off pests. When a problem arises therefore – let us take the example of ladybirds and red spiders – we attract the latter by spraying the problem area diluted vanilla, and once they have feasted and done their job we re-spray with a diluted vinegar infusion which persuades them home to chill out in their ‘hotels’: a series of pollination gardens consisting of a profusion of aromatic plants where both insects and lizards co-exist in harmony. Our vineyard ecosystem also includes a series of mobile trees and bushes whose long term purpose is to teach us which are most beneficial in our many different vineyard parcels so that we can build on our biodiversity; and our polyspecific garden, which is the first thing you see when you come and visit us, now boasting more than 40 species that are native to Castilla y León, hums with life all year long. All these measures play an important part in our wines, for not only do they taste good but they make you feel good and they are both allergen and histamine free. Our labelling announces that we are ecological and organic but it’s nice that we’re truly green and natural into the bargain. Also known as the Bodegas Menade Pollination Garden, this polyspecific (ie. multi-genus) area consists of species indigenous to Castilla y León and buzzes with life all year round. Not only do we have perennial/evergreen species but a multitude of deciduous ones too and the latter, who are often only with us for the spring, provide our many insects with a short-lived multi-coloured feast. The 40 or so species who inhabit our grand Hotel function at a variety of depths and so on one level we have short stemmed aromatic plants such as lavender and sage as well as different types of rosemary; whereas on another we have wild rose, red lavender, blackthorn, elder, and blackberries. All our plants, trees and bushes have simply been carefully plucked – roots and all – from our luckily still abundant many wild remote local places: battle-hardened specimens, hardy by virtue of coming to terms with our changing climate and its inexorable desertification. And within this, we have a minor but important secondary network of mini hotels in very specific parcels of the estate. What we therefore believe to have so far achieved with these micro-systems is an ideal habitat for all manner of insects and other wildlife, including birds of prey. Root systems are of course a further and complicated element of this and it seems likely that within the complicated underground process of competing plant species we may also have inadvertently created a series of major ‘hiding places’ and shelters/breeding grounds for all manner of natural life. Our primary consideration is of course the wellbeing of our vines and so far all looks good, with – as far as we can see – a major proliferation of life and all important balance between flora and fauna. Menade is full of life and, in a region that looks ever more sterile, we’re on a crusade to bring it back to our backyard and in a major way. Each morning we are therefore now greeted by a delightful pair of long haired donkeys – Zamo y Rana – who we rescued from Zamora where their breed is in danger of extinction – and this affectionate duo not only lift our spirits but contribute big time to the new world that we are creating. Our many insects love them too and their organic droppings are also most useful. For company they have both chickens and geese –who are rather more strident– and further plans are afoot to increase this new community. Here at Menade we’re ever honing our eco-system and exploring the further potential diversity of our vineyards with a series of mobile trees and bushes, which are planted in trailers, so that we can shuttle around different parcels and points of our vineyards. The thinking behind this was and is that it would be an economical way of testing their potential impact and provide us with the data necessary to take more important, long term decisions. Accordingly, we’re monitoring and building up a comprehensive picture and data base of the impact of each guest in its temporary resting place and its potential adaptability: which insects are attracted, how and when the leaves and flowers develop, how deep might its roots go, how might it cohabit with other neighbouring plants, and how/if at all might its roots interfere/react with those of our all-important vines in order that we in due course take a view as regards the restructuring of our plants. Roots of course behave and react differently depending not just on climatic factors but fundamentally in accordance with the soil type and so clay is of course an entirely different proposition to those of a lighter texture. This is, needless to say, a long term project and we’re currently trying out dwarf, wild and conventional cherry trees, peach trees, almond trees, holm oaks, and various types of thyme and rosemary. Further, we’ve also been trying out bee panels to study how beneficial these prove at particular times of year – particularly in order to see if these encourage pollination during the time that our vines are flowering. We meantime also sow our soils with wild grasses – usually alternate ones – depending on how active they are, and this creates positive a micro fauna with appreciably more bacteria and more stable and absorbable nitrogen. Similarly, we occasionally aggressively dig out the avenues between our vines in order to break up the underlying interlaced roots and encourage our plants to go vertical rather than sideways and seek further depth. 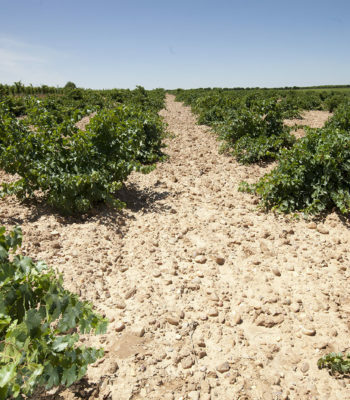 The methods that we’ve developed to look after our vineyards have evolved as a result of trial and error, our restless spirit, listening to those who’ve spent many decades looking after the heritage of Castilla y León and valuing their experience. We do not utilize synthetic or chemical products in our vineyards, opting instead for plant based infusions to prevent vine related pests and diseases. Needless to say, the key to managing this properly is anticipation and this requires continuous scrutiny and observation. Equally, we avail ourselves of our natural resources in order that our wines truly reflect our terroir, who we are and where we live. Horsetail (Equisetum) and sage help us to prevent mildew, yarrow and cinnamon not only fight off oidium but repel mites; and camomile, together with garlic and wormwood, activate plant metabolism. Valerian serves to regulate the vines’ temperature, while infusions of nettle are particularly useful in times of drought as they stimulate more vegetation. We also use whey to combat oídium, which also makes our local cheese producers happy! The practises that we exercize at Menade are the fruit of extensive research, acquired knowledge, and age old wisdom. Plus, of course, a pinch of madness.